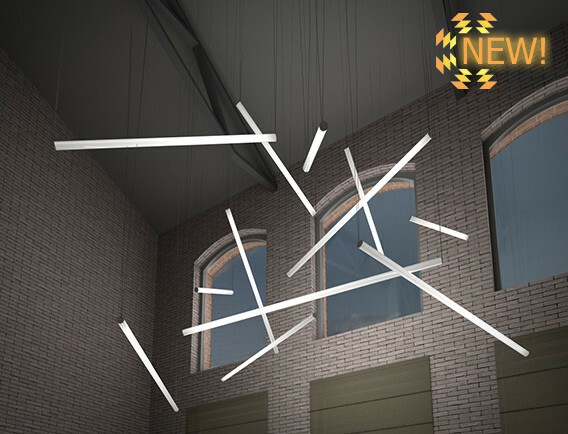 NEVADA is a new line of decorative hanging suspension lamps in a form of straight tubes available in different lengths (70cm to 200cm). It is also available in a standing form, embedded in concrete base. It can be an addition to the suspension lights, creating modern and coherent style for contemporary interiors. It can also be used for lighting work spaces. Due to the suspension on four, independently adjustable metal cords, it is possible to use the lamp practically everywhere, in any place at the ceiling and the rest of the interior space. Combination of a few lamp units of a different length, suspended at various heights at mixed angles, creates a unique light setting. The tubes made of white coloured material are tipped with aluminium endings in three colours: white, black or grey. The lamps are fitted with metal cords directly to points at the ceiling. The power cable is transparent, and the cover of the power source at the ceiling is in white. It is also possible to order a lamp with no cover, when the power source is located further aside, independently from the lamp. The lamps are using very durable and energy saving LED sources of high quality, emitting warm light (2700K-3000K). Depending on a model of the lamp, the suspension version power output is 21W (equivalent of 90W incandescent light) up to 60W (equivalent of approx. 240W). The lamps are powered by 230V power source and are not suitable for dimmers.